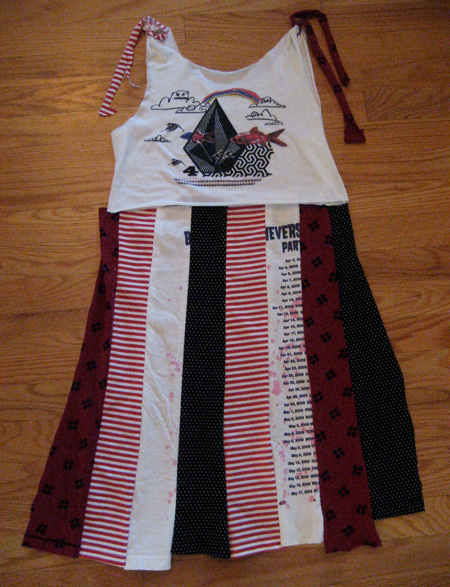 A crazy stitchy day yesterday, several things going at once including this little tshirt remake dress. Big breakthroughs in stitching tshirt fabric: 1. Buy JERSEY needles for your machine. Life-altering and about $3. 2. Zig-zag keeps the fabric stretchy, and it works to set your stitches wide and flat. 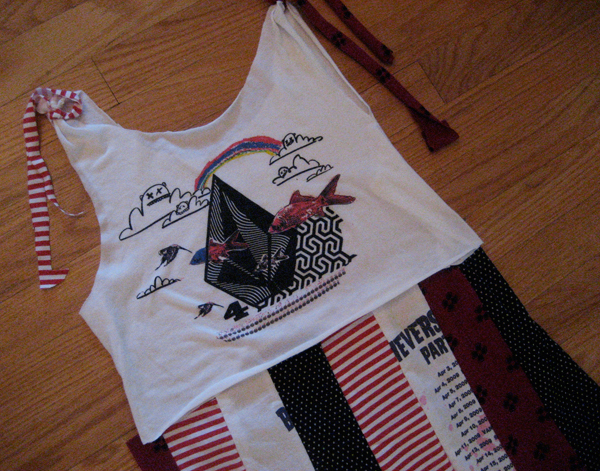 To make the top, just find a tshirt that you like (this one is a thrifted Volcom, I like their graphics!) and that fits your chest and cut it into whatever shape suits you. I tend to like no sleeves (cap sleeves could be cute too), a wider neckline and back to bare my tatt, and a higher waist. 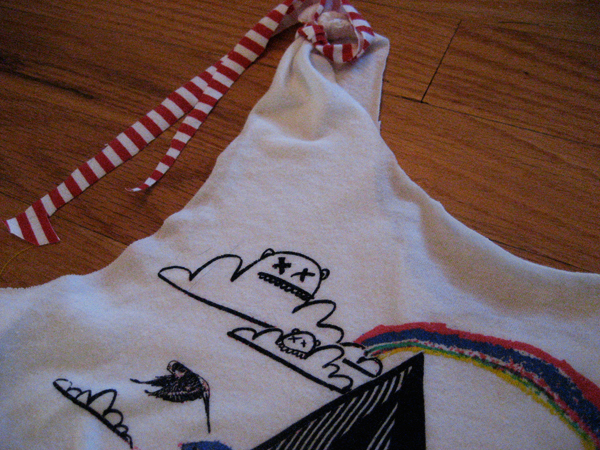 I do this freehand, but you can also use a favorite tank as your “pattern.” Don’t fear the scissors! 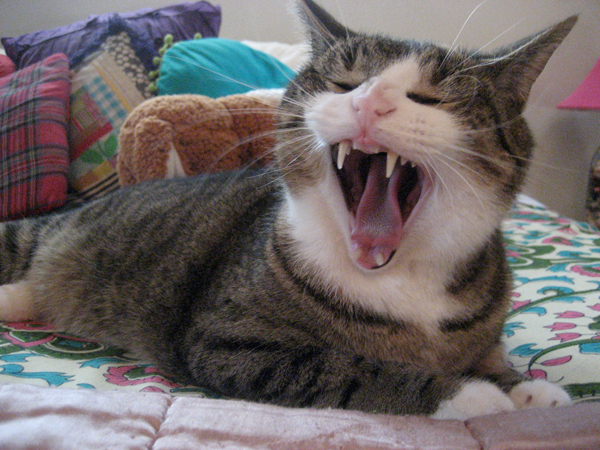 We interrupt this sewing for a kitty break. 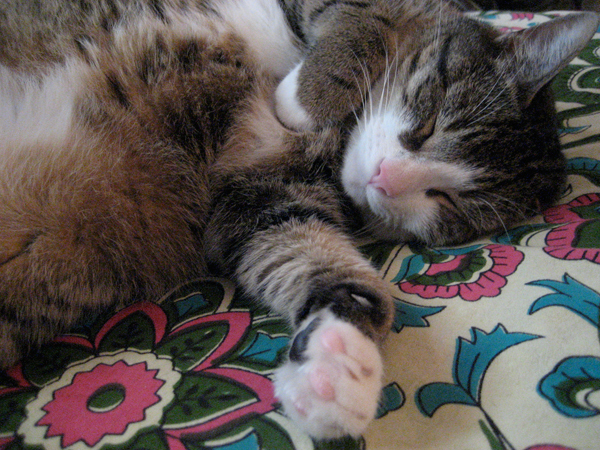 Napping kitties are irresistible, don’t you think? 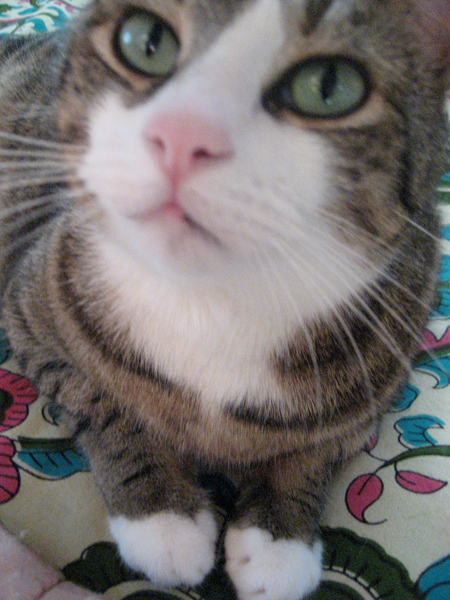 Fully awake, ready for snacks. Or to sit on fabric laid out on floor for cutting. 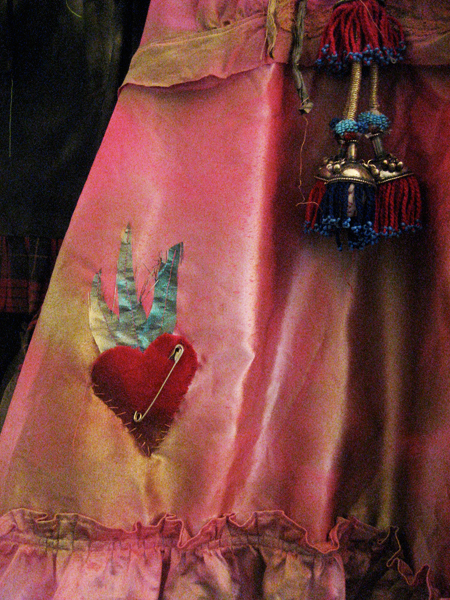 Here is another in-progress thing, a dress, but I’m not sure how it’s going to be finished. I want it to be extremely plain, sort of prairie/nun-like. 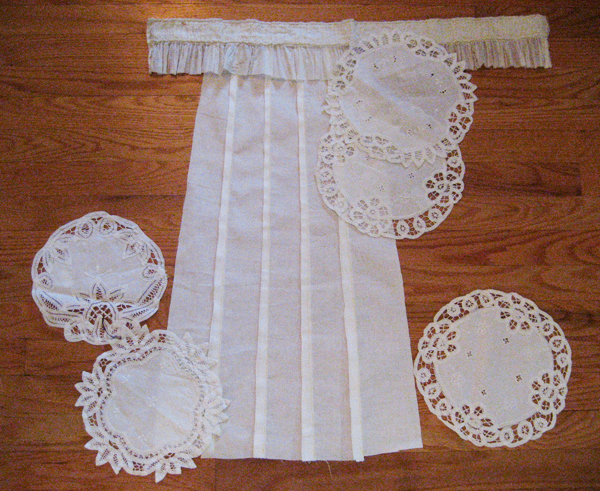 So I may end up not using the pretty vintage doilies (a whole set, thrifted for a couple of bucks). 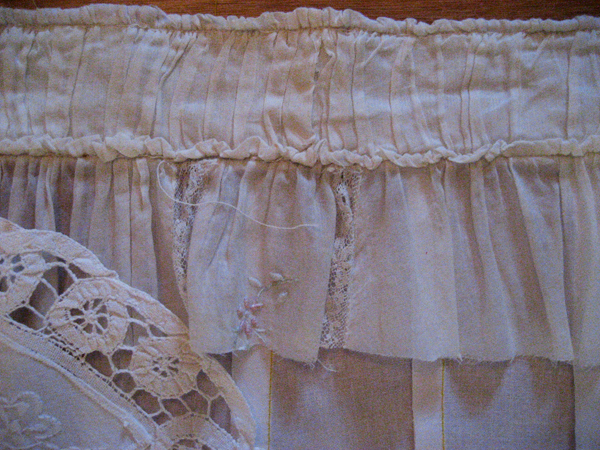 Definitely will use the Victorian scrap pictured at the top of above shot. It’s really lovely. 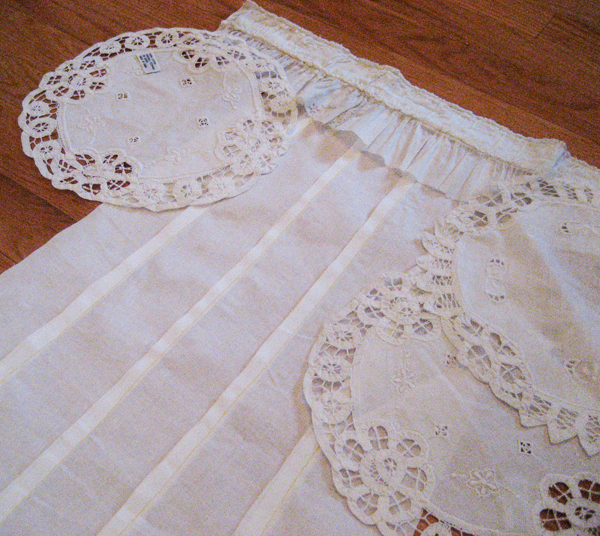 The pieced part will be the main dress, the fabric is sheer and super stiff, like voile. 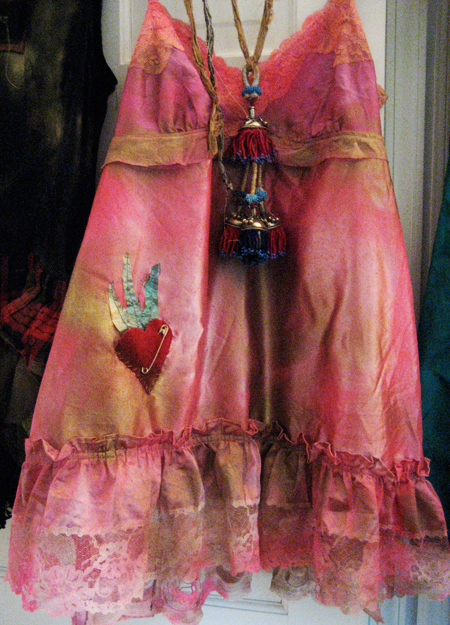 Here’s the finished Desert Babydoll dress, which needed… something… and got a flaming heart treatment + gold spray-painted big safety pin. I just love how this piece looks with my tassel necklace. 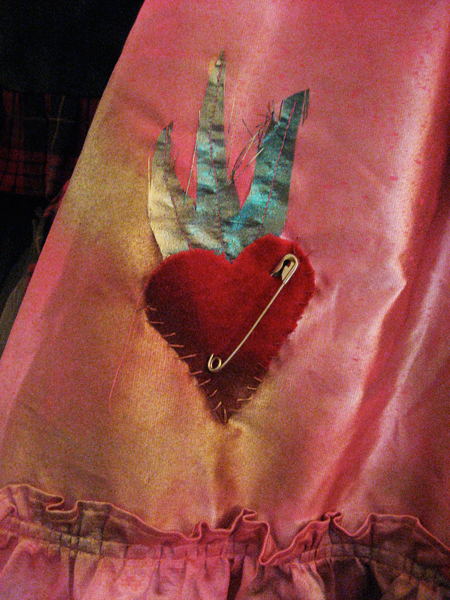 Close up of the velvet heart (it’s a pocket!). The shimmery turquoise fabric is INSANE, and was scored at ScrapDC during one of their fill-a-bag sales. All photos can be seen at full size over on flickr. PS: When you make your top for your tee dress, if you cut off the sleeves, you may find xtra fabric sticking out under the arms, where you’d rather it not be (sticking out). The one pictured had that and I just ran a little seam angled from the gappy fabric down to the actual seam to take up the extra. It worked perfectly. Darts are another option, but a little trickier… doable tho, try pinning front or side darts into your tee and see if it fits you the way you want.